Living Water is a ten-year partnership (2013 to 2023) between the Department of Conservation and Fonterra, working with local communities, dairy farmers, iwi/hapū and other stakeholders to implement game changing and scalable solutions that demonstrate sustainable dairying in healthy freshwater environments. Awarua-Waituna (Waituna catchment) is one of five key focus catchments for the Partnership. 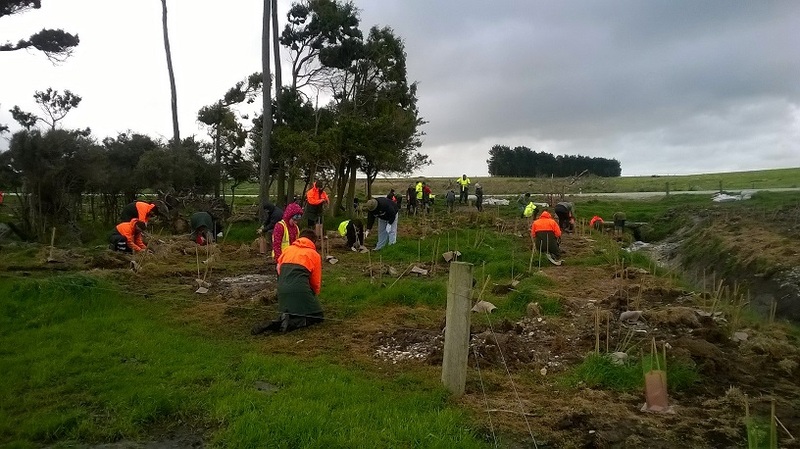 The focus in this catchment is on designing and implementing a catchment-wide approach to nutrient and sediment management using solutions that build ecological resilience, as part of the Whakamana te Waituna integrated freshwater improvement programme. The other sites are in the Kaipara Harbour (Wairua catchment), Waikato Peat Lakes (Areare, Ruatuna, and Rotomānuka), Tīkapa Moana/Firth of Thames (Pūkorokoro/Miranda catchment) and Lake Ellesmere/Te Waihora (Ararira/LII catchment). The vision of Living Water is that a sustainable dairy industry is part of healthy functioning ecosystems that together enriches the lives of all New Zealanders. Living Water Riparian Planting Day 2015. Photo by Department of Conservation.